Happy Thanksgiving. Here's just some odds and ends that I found interesting, I hope you do as well. Let's start with the question, when was the first day of thanks in North America? Why the debate? Well, it appears that there may have been people giving thanks other than the Pilgrims in 1621. In May of 1541, Spanish explorer, Francisco Vasquez de Coronado, led 1,500 men in a thanksgiving celebration at the Palo Duro Canyon. Coronado's expedition traveled north from Mexico City in 1540 in search of gold. The group camped alongside the canyon, in the modern-day Texas Panhandle, for two weeks in the spring of that year. In June of 1546, French Huguenot colonists celebrated in solemn praise and thanksgiving in a settlement near what is now Jacksonville, Florida. The colony was destroyed by a Spanish raiding party in 1565. This "first Thanksgiving," however, was later commemorated at the Fort Carolina Memorial on the St. Johns River. On August 9th, 1607, English settlers led by Captain George Popham joined Abnaki Indians along Maine's Kennebec River for a harvest feast and prayer meeting. The colonists, living under the Plymouth Company charter, established Fort St. George around the same time as the founding of Virginia's Jamestown colony. Unlike Jamestown, however, this site was abandoned a year later. In the spring of 1610, Colonists in Jamestown, Virginia held a thanksgiving prayer service after English supply ships arrived with food. The harsh winter of 1609-1610 generated a famine that decimated the settlers. The group was reduced from 490 members to only 60 survivors who were forced to dire measures such as eating their horses. 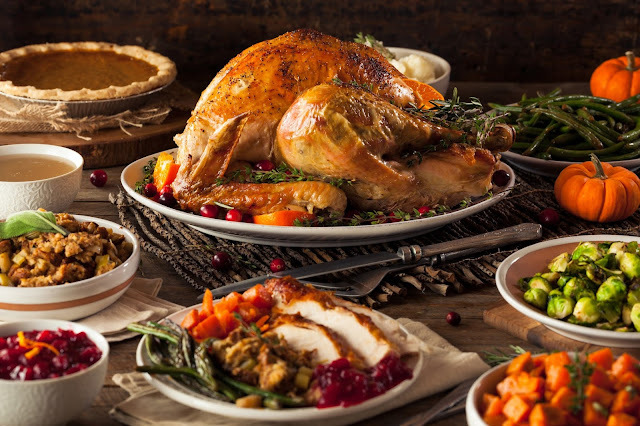 The colonial celebration which followed the arrival of the ships with food has also been considered the "first Thanksgiving." In October of 1621, the Pilgrims at Plymouth Colony celebrated the autumn harvest with a three-day feast. Governor William Bradford invited the chief of the Wampanoag tribe, Massasoit, to join the fifty colonists who had survived the harsh winter. The Native American leader brought ninety of his tribesmen to the feast. The celebration included athletic contests, a military review led by Miles Standish, and a feast on foods such as wild turkeys, duck, geese, venison, lobsters, clams, bass, corn, green vegetables, and dried fruits. In 1841, Dr. Alexander Young contended that this harvest celebration was the "first Thanksgiving," and the origin of an American tradition. This interpretation gained such widespread acceptance that other contenders for the distinction faded into obscurity. That such a Band of Union, founded upon the best Principles, unites the American Colonies; That our Rights and Priviledges ... are so far preserved to us, notwithstanding all the Attempts of our barbarous Enemies to deprive us of them. And to offer up humble and fervent Prayers to Almighty GOD, for the whole British Empire; especially for the UNITED AMERICAN COLONIES ..."
Of course, less than a year later, Britain's American colonies ultimately severed all ties with the British with the signing of the Declaration of Independence in 1776. After the U.S. victory over British forces in October of 1777 at the Battle of Saratoga, the Continental Congress recommended that the colonies observe a day of thanksgiving. On November 30, 1777, the commander-in-chief of the Continental forces, George Washington, issued General Orders setting aside Thursday, December 18 "for Solemn Thanksgiving and Praise." All thirteen colonies celebrated on December 18 while Connecticut, Massachusetts, New Hampshire, and Vermont sponsored additional thanksgiving observances on separate days. The tradition of thanksgiving days sponsored by the Continental Congress continued through 1784 with proclamations such as the October 1782 decree. On October 3rd, 1789, the first President of the United States, George Washington, proclaimed November 26th to be a day of national thanksgiving and prayer after receiving Congressional requests for such a decree. He wrote in his November 26th, 1789, diary entry: "Being the day appointed for a thanksgiving I went to St. Pauls Chapel though it was most inclement and stormy -- but few people at Church." President Washington later provided money, food, and beer to debtors spending the holiday in a New York City jail. Thanksgiving failed to become an annual tradition at this time. Only Presidents Washington, Adams, and Madison declared national days of thanks in their terms. Thomas Jefferson and John Quincy Adams considered the practice to infringe upon the separation of church and state. Governors, on the other hand--particularly in the New England states, regularly issued proclamations of thanksgiving. On April 13th, 1815, President James Madison proclaimed a national day of prayer and thanksgiving after the end of the War of 1812. U.S. and British emissaries effectively ended the conflict with the signing of the Treaty of Ghent on Christmas Eve, 1814 in Belgium. The treaty restored the pre-War of 1812 boundaries of the U.S. and Canada, but it did not address British violations on the high seas and the imprisonment of American seamen. A joint commission was appointed to address those other concerns. During the war, President Madison proclaimed three days of fasting and prayer in response to Congressional requests (August 20, 1812, September 9, 1813, and January 12, 1815). He was the last president to call for a national thanksgiving until Abraham Lincoln in 1863. Sarah Hale, who was the editor of Godey's Lady's Book, began a letter-writing campaign to establish the last Thursday in November as a national Thanksgiving Day. She began writing essays calling for the national celebration of the holiday as the editor of Boston's Ladies' Magazine in 1827. Godey's merged with Ladies' Magazine in Philadelphia a decade later and Hale's editorials reached an audience of approximately 150,000 people. In 1846, Sarah Hale moved beyond her readership and for the next 17 years directly petitioned state and federal officials. Her perseverance yielded increasing response from state governors and other politicians such as Abraham Lincoln's Secretary of State, William Seward. Let us in the public temple of religion, by the fireside and family altar, on the prairie and in the forest, join in the expression of our gratitude, of our devotion to the God who brought our fathers safely through the perils of an early revolution, and who thus continues his favors to the remotest colonies of his sons." Such sentiments were echoed throughout states and territories as Thanksgiving became a national tradition even before it became a national holiday. At which time amongst other Recreations, we exercised our Armes, many of the Indians coming amongst vs ... with some nintie men, whom for three dayes we entertained and feasted, and they went out and killed fiue Deere, which they brought to the Plantation and bestowed upon our Governour, and upon the Captaine, and others." The documents fueled 19th-century interest in the Puritan colony and influenced the eventual association of the colony with Thanksgiving Day. On November 28th, 1861, Union and Confederate troops celebrated Thanksgiving Day away from their families during the first year of the Civil War. The conflict threatened to permanently divide the nation. Both the Union and Confederate Congresses called for days of thanksgiving after key military victories throughout the war. On September 28th, 1863, editor Sarah Hale then wrote a letter to President Abraham Lincoln encouraging him to proclaim a national Thanksgiving Day. This was part of Hale's 17 year campaign to establish Thanksgiving Day as a national holiday. "The influence of these state seasons of sacred remembrances, high aspirations, and tender . . . rejoicings would not only be salutary on the character of our own citizens, but the world would be made better . . . . If the germ of good feeling be ever so deeply buried under 'the cares, and riches, and pleasures of this life,' it may be brought out by sympathy and vivified by culture and effort." On Thanksgiving Day in 1876, The American Intercollegiate Football Association held its first championship game. The sport resembled something of a cross between rugby and modern-day football, but the tradition of playing football on Thanksgiving Day developed with the evolution of the sport itself. By the 1890s, Yale and Princeton drew upwards of 40,000 fans for the collegiate championship games. Fact is, by then more than 5,000 clubs, colleges, and high school football games were played on the Thanksgiving holiday. In 1917, Americans celebrated the holiday in the midst of World War I. The war in Europe had begun in 1914, but President Woodrow Wilson asked Congress to declare war on Germany in April 1917 after the sinking of the Lusitania. At the time, Director Herbert Hoover of the newly established Food Administration, asked farmers to increase food production and compelled civilians to ration consumption by observing certain days of the week as "wheatless," "meatless," or "porkless." This slightly altered traditional Thanksgiving meals as families relied upon the foods available in their "war gardens." To help Americans, guides such as 1917's "Best War Time Recipes" provided methods for making foods such as corn bread and muffins while adhering to the necessary rations. In 1921, the community of Plymouth, Massachusetts erected a statue memorializing the Wampanoag Indian leader, Massassoit, 300 years after he and 90 of his tribesman joined the 57 Puritans at Plymouth Colony for a three-day feast of thanksgiving. The inscription on the statue reads, in part, "Massasoit, great Sachem of the Wampanoags, Protector and Preserver of the Pilgrims, 1621." In 1920, Gimbel Brothers Department Store in Philadelphia sponsored the first Thanksgiving Day parade when fifteen cars, fifty people, and a fireman dressed as Santa Claus paraded through the streets. It concluded when Santa scaled a ladder into Gimbel's toy department. In 1924, employees, friends, and families of Macy's sponsored the store's first annual Thanksgiving Day Parade in New York City. The Macy's Thanksgiving Day parade became the standard that commemorated the official start of the Christmas shopping season. In 1927, puppeteer Tony Sarg created the first giant balloons for the Macy's parade. The event was later featured in films such as A Miracle on 34th Street (1947). Each year, millions of people line New York City's streets during the parade while millions more tune into national television coverage. In 1934, over 26,000 fans watched the Detroit Lions face the Chicago Bears at the University of Detroit Stadium. Radio executive George Richards had purchased the Portsmouth Spartans, moved them to Detroit, and renamed them the Lions after the 1933 football season. That was the first National Football League game held on Thanksgiving Day. It was broadcast on the NBC radio network by 94 stations to a nationwide audience. Other than between 1939 and 1944, the Detroit Lions game became an annual event. Television broadcasts of the game began in 1956. In 1939, President Franklin Delano Roosevelt declared November 23rd, the next-to-last Thursday of the month, to be Thanksgiving Day. This break with tradition was prompted by requests from the National Retail Dry Goods Association to extend the Christmas shopping season by one week. Roosevelt had rejected the association's similar request in 1933 on the grounds that such change might cause confusion. The President's 1939 proclamation proved him more right than he probably would have liked. As always, the president's 1939 proclamation only directly applied to the District of Columbia and federal employees. While governors usually followed the president's lead with state proclamations for the same day, on this year, twenty-three states observed Thanksgiving Day on November 23rd, twenty-three states celebrated on November 30th, and Texas and Colorado declared both Thursdays to be holidays. Football coaches scrambled to reschedule games set for November 30th, families didn't know when to have their holiday meals, calendars were inaccurate in half of the country, and people weren't sure when to start their Christmas shopping. The nation was again divided over the date of Thanksgiving Day in 1940. The day was November 26th, 1941, after two years of confusion and complaint, President Franklin D. Roosevelt signed legislation establishing Thanksgiving Day as the fourth Thursday in November. Calendars and holiday plans were already set for the third Thursday in November, 1941 so the legislation took effect in 1942. Roosevelt, recognizing the problems caused by his 1939 decree, had announced a plan to return to the traditional Thanksgiving date in 1942. But Congress introduced the legislation to ensure that future presidential proclamations could not impact the scheduling of the holiday. Their plan to designate the fourth Thursday of the month allowed Thanksgiving Day to fall on the last Thursday five out of seven years. On Thanksgiving Day, 1942, London's Westminster Abbey held its first secular service in nine centuries when it hosted a Thanksgiving event for U.S. troops stationed in England during World War II. More than 3,500 people filled the church for a program featuring patriotic songs such as "The Star-Spangled Banner" and "America the Beautiful." The U.S. officially entered the war on December 8th, 1941, one day after the Japanese attack on Pearl Harbor. Food rations, troop deployments, and fierce battles dampened many holiday celebrations until the end of the war in August 1945. On November 28th, 1963, just six days after the assassination of President John F. Kennedy, President Lyndon Johnson addressed the nation on Thanksgiving Day. He announced that Florida's NASA Launch Operation Center would be renamed the John F. Kennedy Space Center and he asked the public to remain "determined that from this midnight of tragedy we shall move toward a new American greatness." On November 22nd, 2001, the nation was still reeling from our being attacked on September 11th when Muslim terrorists high-jacked planes and flew them into the World Trade Center in New York City. Because of the tragic loss of life and the deployment of U.S. troops overseas. Citizens maintain daily routines but remained vigilant of potential risks in this country and abroad. Instead of being fragmented and divided as hoped by our enemies, Americans united for a time. Just a year earlier, the longest Presidential Election in U.S. history took place and among the questions being asked, besides who would be president, who would pardon that year's Thanksgiving turkey? While some like to point to President Harry Truman's "pardon" of a turkey the day before it was scheduled to be a main attraction at the White House Thanksgiving dinner in 1947. That tradition was actually started by President Lincoln after his son Tad asked that the turkey meant for their Thanksgiving feast to be pardoned. The pardoning of one lucky bird is now an annual Thanksgiving event at the White House. It's a tradition featuring poultry humor, holiday history, and the commutation of a trip to the chopping block into a life-long stay in a Herndon, Virginia petting zoo. I compiled this information from various sources including a timeline history of Thanksgiving. I hope you enjoyed this. From my family to yours, Happy Thanksgiving and God bless!